Kitchen and Residential Design: Reader question: what about mixing metals? Q: Help! I changed out the ceiling light in my dining room with a brushed nickel finish. The lights in my kitchen & foyer are shiny brass. I'd like to replace the finish in the guest bath with nickel as well. But all my doorknobs and hinges throughout the house are shiny brass. Gosh, will I have to replace all these as well? Or can I mix them up? What misguided soul is advising you and where does the idea come from that metals need to match everywhere? Oy. Well the answer is an emphatic no --there is no rule that says all metals in an entire house have to have matching finishes. While I'm at it, there really aren't any rules period. Design doesn't have rules; it has guidelines and accepted practices but these are hardly universal laws. Further, all of these guidelines and accepted practices share a common thread of intention. Spaces look designed because someone thought about them and imposed some kind of order on a disorderly universe. That's the big picture as I see it anyway. Human beings are pattern-recognition machines. It's the root of our success as a species, and good design harnesses human brains' automatic pattern recognition skills. Better design manipulates and guides those same skills. I wrote about the Rule of Three a couple of months ago and that Rule of Three is nothing more than a pretty basic pattern (some would say the most basic pattern). Introducing a pattern and then sticking with it is fundamental and it's the easiest way to tackle things like metal finishes. When I'm working with a client and the topic of metal finishes comes up, it's usually in the context of a kitchen and whether or not the knobs and pulls need to match the faucet and sink. The answer again is a resounding no, but what those metal finishes have to do is make some kind of sense. So the easiest way to do this is to introduce a logic to the room you're working with. By a logic I mean a set of rules you're going to use as a guide. Here's a good example. 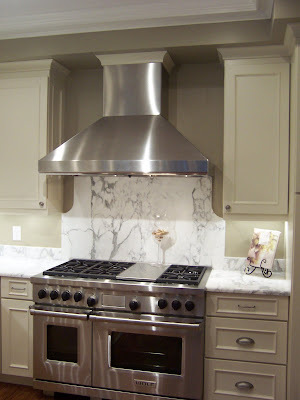 This kitchen featured a Wolf range and an equally spendy range hood. 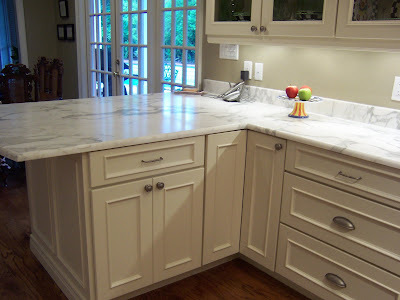 My client wanted them to be the focal point of this side of her kitchen, so they are the only elements that are shiny. Your brain and my brain and everybody's brain is drawn to shiny objects. Shiny stuff stands out and things with a matte finish retreat into the background. So when I picked the knobs and pulls, I went with a pewter finish so that it wouldn't draw any attention away from the range and the hood. Once that was established, I decided that any cabinet that had hinges would get a knob. That pretty much means all of the doors got knobs. The next rule was that anything that pulled out got a handle. So the drawers got handles. My client wanted to use some cup pulls, so I made an amendment to the second rule. So shallow drawers got a handle and deep drawers got a cup pull. We kept the same pewter finish on all of the knobs, handles and cup pulls to connect them. On the wall opposite the range, the sink and faucet were the focal points, so I picked a stainless steel apron front sink and a tall goose neck faucet, also in stainless. These two metal finishes are doing different jobs (one grabbing attention, the other avoiding the spotlight) and so they have different finishes. See? Easy. 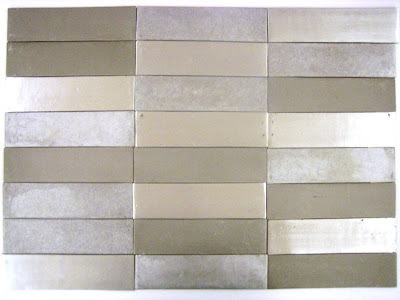 So the answer to your question is still an emphatic no, your metal finishes don't have to match. They don't have to match but they do have to make sense. So make a room-specific set of rules for your project. It can be as simple as "Light fixtures have nickel finishes, door hardware has brass," and you can leave it at that. What a wonderful post! This is a question we all deal with so often - Glad to have you "officially" set the record straight. Great post! Thanks Gina. Put in a good word for me at the Wasington Post! Life's more interesting when things don't match if you ask me. A copper faucet huh? A real one or one that just looks like copper?